17 Days | 1 Million Eyeballs | 1,177 Referrals! | ASTRALCOM - Content Strategy, Conversion Marketing and Customer Acquisition. 17 Days | 1 Million Eyeballs | 1,177 Referrals! In just 14 days our adZooks! syndicated banner ad service delivered over ½ a million ad views and directed 1,177 people to our client’s website. These are targeted customers from local, regional and national sources who are looking for what this client has. At this rate, in one month they will have had more than a million ad views and more than 2,350 referrals to their website, not to mention the increased foot-traffic that comes from increasing their brand awareness. 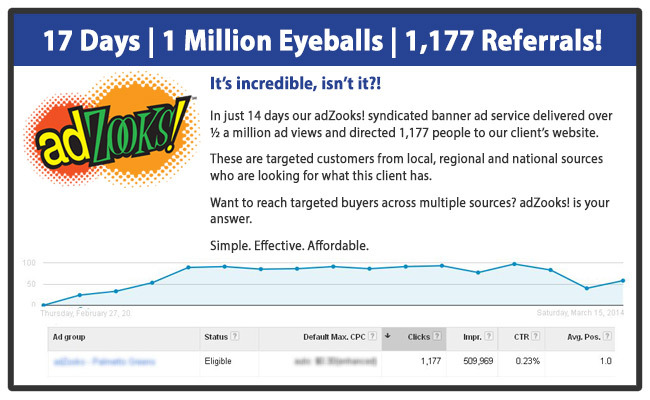 While this may be an outstanding example, we typically generate more than ½ a million ad views and send between 650 – 1,200 referrals each month to each of our clients on adZooks! Want to reach targeted buyers across multiple sources, like this? adZooks! is your answer.